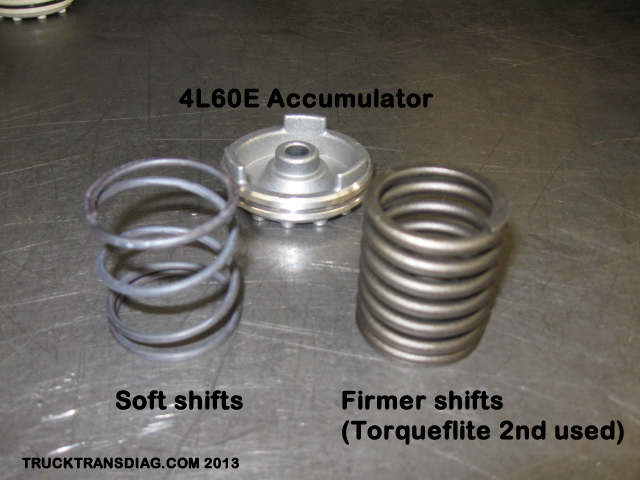 There's a ton of 4l60E shift kits on the market out there and all kinds of different results and costs. here we will give you some simple and inexpensive or just free upgrades you can do to improve the shift characteristics of your 4L60E transmission. these are not "race car" upgrades but ones that will work for your truck or street hot rod type vehicle. Scotch Brite the piston bores in the case with a light Scotch Brite. this will give the new seal a better "bite". 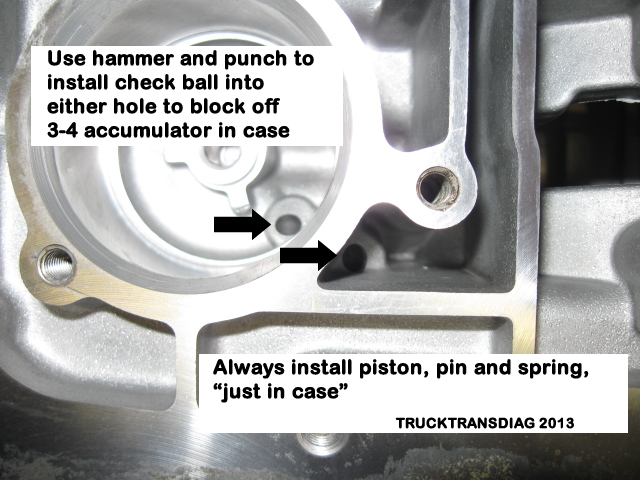 The 1-2 accumulator usually has 2 springs and is acceptable as is but you can make better with lighter spring, if you turn over the piston and spring assembly here you will have very firm 1-2 shift, you can try but may not like! 3-4 accumulator has very light spring and you can put the huge spring out of torqueflite 2nd and will be nice and firm, or you can even block the feed hole and have same result, we've wondered why they even have this accumulator sometimes? For Accumulator basic function see our Accumulator bulletin. Band servo: the size of the band servo determines the quality or firmness of the 1-2 shift, there are 4 different size servos, casting number on large piston for "corvette" servo is: 8642093 and makes for the firmest shift, you may not want to use on 4 cyl. or diesel as will be too harsh. This works great in trucks and some even come with it from the factory, you need to change both the large piston and divider ring to update your transmission. There are also several aftermarket larger servos available that work very nicely for hot rods. Drill out the clutch feed holes in the separator plate. click here for instructions. these are beginning guidelines and you can adjust as you feel fit. 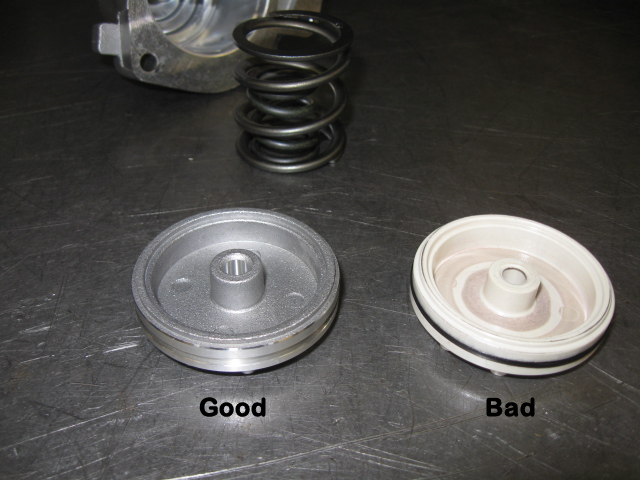 Pressure regulator valve: inspect and replace boost valve and sleeve if worn, you can upgrade the regulator spring with pressure boosting spring/valve kits. we recommend the Sonnax line pressure booster kits, they come with new boost valve/sleeve and upgraded pressure regulator spring.